In 1972 The Godfather was released to worldwide critical acclaim, directed by Francis Ford Coppola the film is based upon Mario Puzo's best selling novel of the same name. Starring screen legend Marlon Brando as crime boss Vito 'The Godfather' Corleone alongside a previously unknown Al Pacino as his son Michael Corleone in his first major film role with support from James Caan, Robert Duvall and Diane Keaton. The Godfather was a major box office success becoming the highest grossing picture of all time and was nominated for eleven Academy Awards winning for Best Picture, Best Actor (Brando) and Best Adapted Screenplay for Puzo and Coppola. The film remains a landmark in world cinema, frequently regarded as one of the greatest films of all time and responsible for propelling Best Supporting Actor nominee Al Pacino to super stardom. The Godfather Part II was released in 1974 acting as both a sequel and prequel to The Godfather with half of the film set after the events of its predecessor and the other half set in the early 1900's chronicling the rise to power of a young Vito Corleone, it was the first film to use 'Part II' in its title which would later become a standard of the industry. Al Pacino reprised his role as Michael Corleone and did several of the supporting cast including Robert Duvall, Diane Keaton, John Cazale and Talia Shire. One of the most difficult decisions faced by director Francis Ford Coppola was who to cast in the role of the young Vito Corleone given they would be playing the same character so beautifully portrayed by Academy Award winner Marlon Brando. 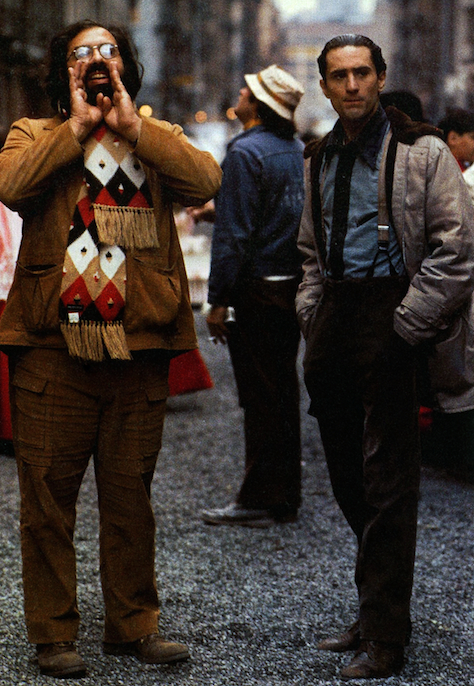 Having seen his portrayal of Johnny Boy in Martin Scorsese's 1973 crime film Mean Streets Coppola decided upon the then relatively unknown Robert De Niro who had previously auditioned, unsuccessfully, for a role in The Godfather some two years earlier, he spent months learning the Sicilian dialect in which the majority of his lines are spoken. After the murder of his family at the hands of Don Ciccio a nine year old Vito Andolini escapes to New York, where he takes the name Corleone after the Sicilian town in which he was born. By 1917 Vito is living with his wife and children, Sonny, Fredo and Michael, he teams up with fellow youngsters Clemenza and Tessio who face extortion by Don Fanucci after he demands a cut of their profits from petty crime, Vito murders Fanucci and becomes a well respected and feared figure in the community. Later he returns to Sicily and murders Don Ciccio avenging his parents deaths. 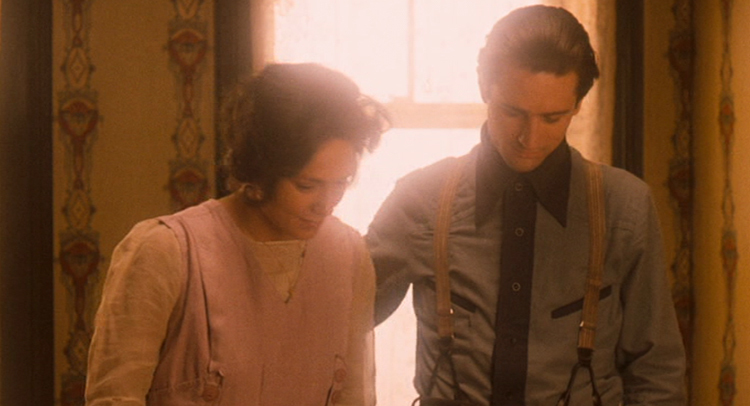 These scenes are presented parallel to the events surrounding Michael Corleone (Al Pacino) in the present day with switching narratives throughout the film. 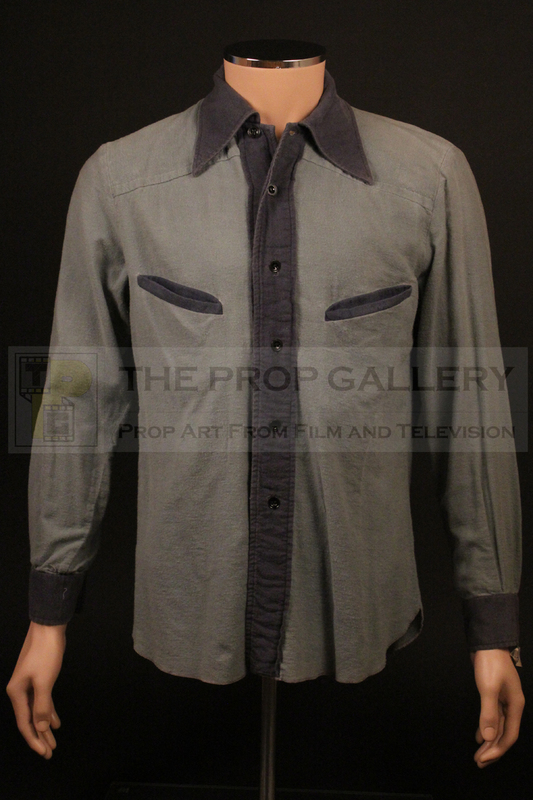 This shirt was worn by Robert De Niro in his portrayal of the young Vito Corleone, bespoke made for the production by Western Costume this distinctive light blue shirt features contrasting dark blue collars, placket and cuffs and represents arguably the most recognisable element of his costume which is worn in several of the flashback scenes. 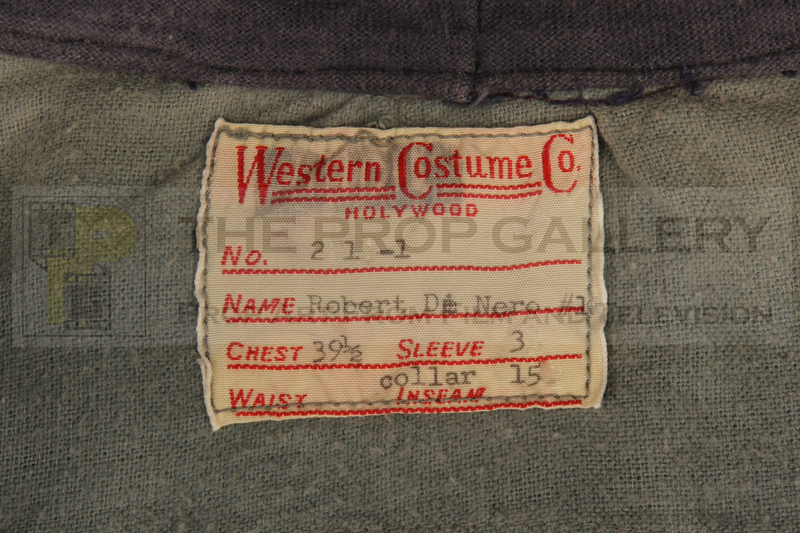 The shirt features a period Western Costume label to the interior collar which is type written '2713-1' Robert De Nero' with chest, sleeve and collar sizes, note the misspelling of De Niro's name who was virtually an unknown performer during production. For reasons unknown, possibly accidental, at least one of the shirts made for production features one button to the cuff and another with a double button cuff. 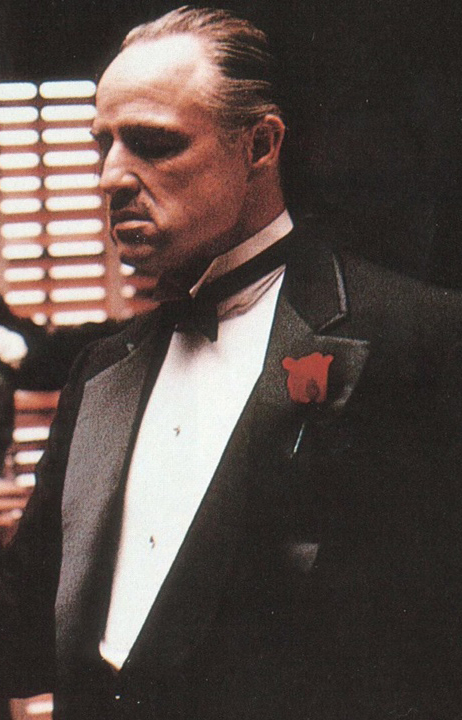 The double button cuff version is seen on screen as Vito has dinner with Clemenza and Tessio whereas after his rise to power the shirt has only a single button to the cuff. 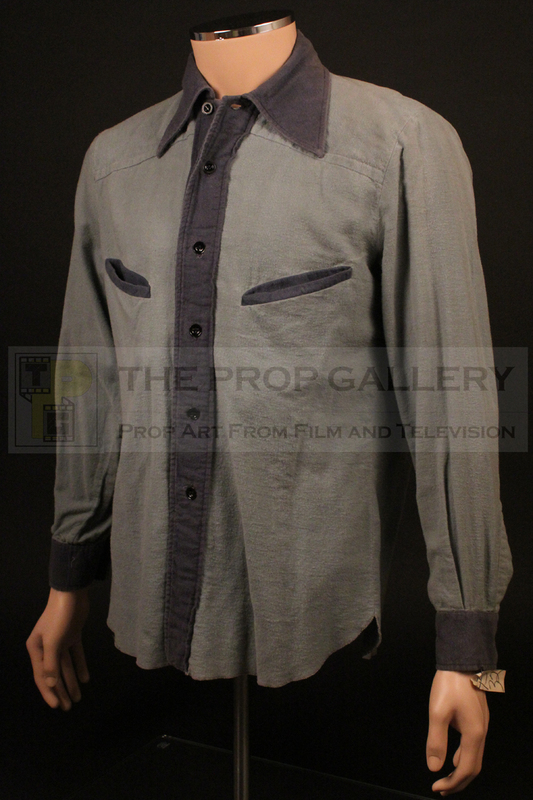 This shirt has the single button cuff which is also the version used in the famous shots featuring Robert De Niro and Al Pacino which were taken by noted photographer Steve Schapiro during a filming break. 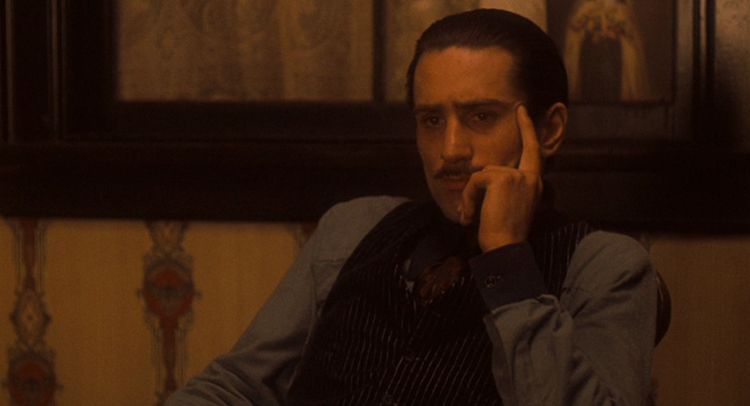 Upon its release The Godfather Part II received immediate critical acclaim and is considered by some to be superior to The Godfather, to this day, like its predecessor, it remains one of the most highly regarded and influential pictures ever made. 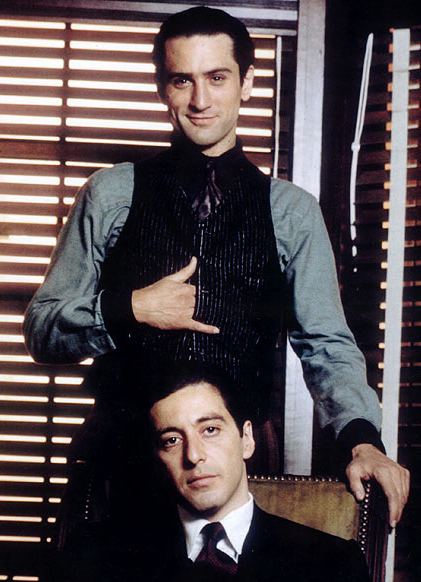 The film was nominated for eleven Academy Awards winning six including Best Picture, Best Director for Coppola and Best Adapted Screenplay for Coppola and Puzo as The Godfather had previously. 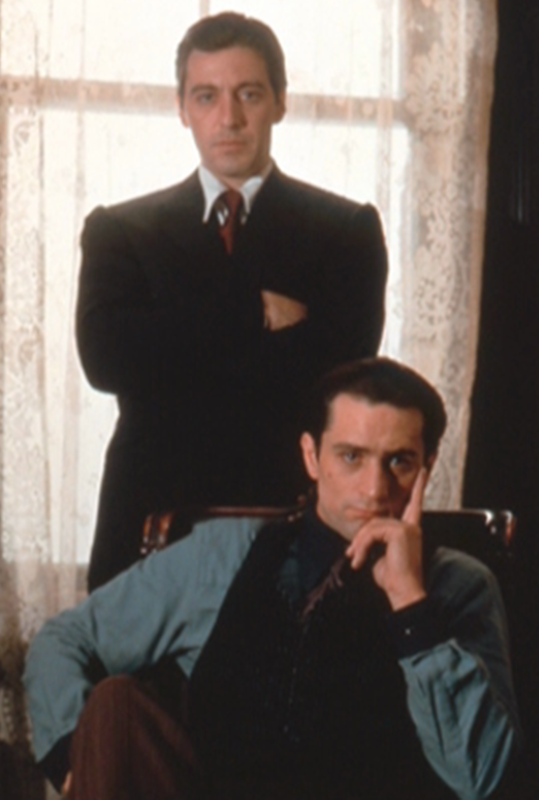 Coppola's casting decision proved to be a good one with Robert De Niro receiving the Academy Award for Best Supporting Actor, this remains the only time that two different actors (the other being Marlon Brando) have been recognised by the Academy for portraying the same character and the only time that a picture and its sequel have been bestowed the Academy Award for Best Picture. As with Pacino in The Godfather Coppola's decision to cast Robert De Niro would prove to be an inspired one with him going on to become one of the most celebrated actors of his generation who has since provided some of the most memorable performances in film, his body of work virtually unrivalled De Niro has been the recipient of accolades too numerous to list but include the Academy Award for Best Actor, for Raging Bull, and the AFI Life Achievement Award for his outstanding contribution to film. 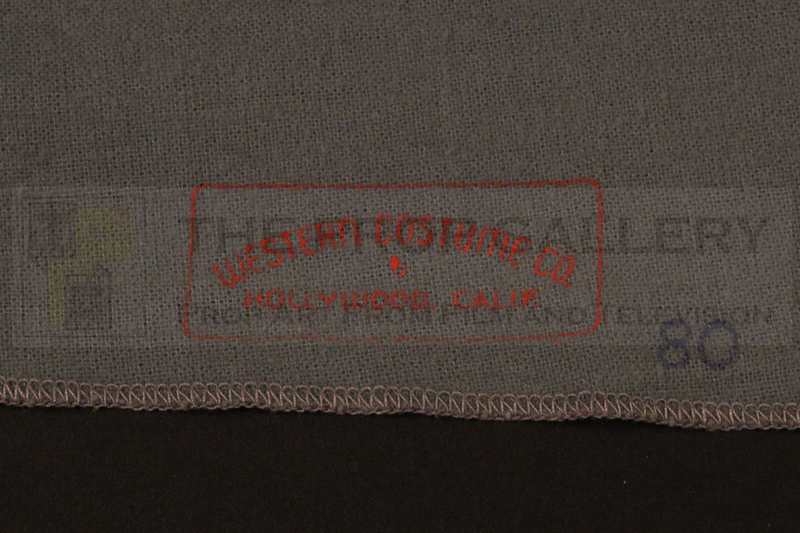 This represents an incredibly rare and recognisable costume element from one of the most highly regarded pictures in cinematic history worn by an individual who is frequently counted among the greatest actors of all time.